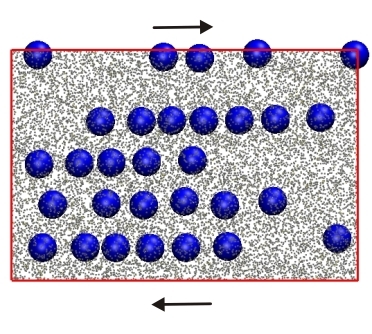 We have developed Responsive Particle Dynamics (RaPiD) to simulate soft matter at the mesoscopic level, by modeling complex molecules as single particles. The crux of the method is that every particle pair is endowed with an internal coordinate describing the evolution of the pair interaction, thereby naturally introducing the transient forces responsible for the memory effect of viscoelastic fluids. RaPiD has succesfully been applied to study shear-banding resins, shear-fracturing telechelics, and shear-induced alignment (picture) of colloids dissolved in worm-like micelles, among others. 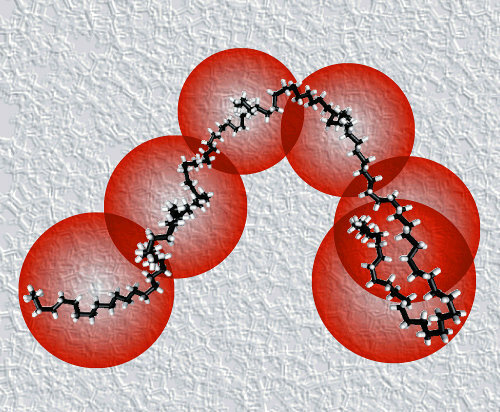 Atomistic molecular dynamics simulations of polymer melts become exceedingly slow for chains beyond ~100 carbons. Longer chains require coarse-grained models, combining ~20 carbons into a single particle, but the effective interactions between these beads are so soft that the chains lose their most important feature: their uncrossibility. 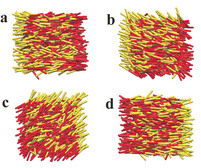 We have developed twentanglement to preserve uncrossibility in coarse-grained simulations, thereby recovering excellent scaling laws (diffusion with power -2, viscosity with power 3.5) for linear polyethylene upto 1000 carbons. We have pioneered event-driven Brownian dynamics, in order to study the flow behaviour of liquid-crystalline suspensions of elongated hard rods. The simulations clearly show the collective tumbling motion of the rods under shear flow, in good agreement with the motion of the director in experiments. The simulations reveal that the rods tumble at all shear rates, and explain why measured directors stops tumbling at a critical shear rate.